HCM CITY (VNS) — A child was killed and eight persons were injured when a bus collided with motorbikes travelling in the opposite direction on Cay Go Flyover in HCM City on Wednesday..
Dr Dinh Tan Phuong of Nhi Dong 1 Hospital said a 16-month-old child was admitted to the hospital's first-aid ward yesterday with serious head and body injuries. Police reports said the parents were taking the child on a motorbike to school during rush hour. 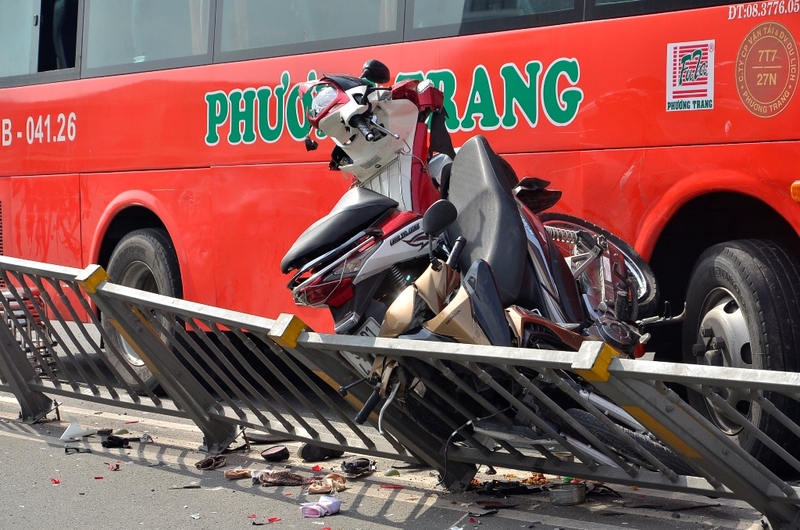 A bus of the Phuong Trang Company suddenly plunged into the road divider, and crashed into seven motorbikes that were travelling in the opposite direction. The child fell down from the 10m-high bridge. The mother of the dead child is being treated for brain injuries in Cho Ray Hospital.